Note: This document assumes you are familiar with Alexa Skills Kit concepts such as intent, intent schema, slot, and sample utterance. See Create the Interaction Model for Your Skill for more about these concepts. The built-in intent library gives you access to built-in intents that fall into categories, such as weather forecasts and local business searches. You can use these intents to add functionality to your skill without providing any sample utterances. Add the intent name to your intent schema. Implement a handler for the intent in your code. Intents in the library are named according to a structure using actions, entity types, and properties (described in more detail below). Understanding this naming convention can help you understand the purpose and use of each intent. Intents in the library also have slots for providing additional information from the user's utterance. The slots are provided automatically, based on the entity types used within the intent definition. This means you do not define them in the intent schema. In contrast, the standard built-in intents like AMAZON.HelpIntent cannot use slots. For brevity, most JSON examples in this document show just the intent definitions within the intents array and not the rest of the schema. See Interaction Model Schema for the complete intent schema compatible with the developer console and the Skill Management API. Although no slots are defined in the above schema, an utterance like "what's the weather today in Seattle" would send your skill a request with slots containing today's date and the city "Seattle." These intents are assembled from a set of actions, entity types, and properties. The name of each intent combines these elements into an intent signature (for instance, AMAZON.SearchAction<object@WeatherForecast>). You use this signature as the intent name. To see the full set of intents you can use in your skill, go to Built-in Intent Library. To see a sample intent schema for a simple weather forecast skill, see Example: A Weather Skill with the WeatherForecast Intents, below. If you want to understand the actions, entity types, and properties used in the naming structure for the intents, continue with the sections below. Note: The intents described in this document can be used in English (US) skills. They are not available for skills in any other languages. Although you can use the built-in intents just by adding the intent signatures to your intent schema, it may be helpful to understand the structure of the intent signature. The intents in the built-in intent library are defined by a set of actions, entity types, and properties. Similar to a programming language, the actions and entity types are classes that have properties. An intent signature assembles these building blocks into a name that you can use in your intent schema. An action represents an action the user is trying to take, such as searching for information. For instance, SearchAction represents the "searching for information" action. An intent defined with SearchAction indicates that the user wants search or look up information, such as finding a weather forecast or finding the phone number for a nearby coffee shop. An intent defined with AddAction indicates that the user wants to add information somewhere, such as adding an event to a calendar or adding the title a book to a reading list. Most actions operate on other objects or use other objects. A search action needs to identify the information to search for. An add action needs to identify the item to add and possibly also the list to which to add it. These items are specified using the properties of the action. For example, SearchAction has an object property that identifies the type of information the user wants to find. AddAction has a targetCollection property to identify the type of the target list and an object property to identify the type object to add to the list. An entity type represents the objects that the actions can act on or use. Entity types also have attributes, which are represented by properties. For example, WeatherForecast is an entity type that defines a weather forecast. It has properties such as location, duration, and temperature (among others). Consider the utterance "what is the weather in Seattle today?" The entire utterance indicates that the user wants to search for something or find information. The "object" of the search – the information the user wants to find – is a weather forecast. This is the main focus or purpose in the sentence. The words "Seattle" and "today" are attributes of the weather forecast the user wants to find. The SearchAction action represents the user's intent to search for information. The object property of SearchAction represents the entity type to find. Note: The object property is named 'object' because it generally represents the grammatical object of the sentence the user states. The WeatherForecast entity type represents a weather forecast. The WeatherForecast entity type has properties that represent possible attributes of a weather forecast, such as the location and date (location and startDate). The above items form the intent signature. Add Book to Reading List. Note: Note that spaces are not allowed in the intent names. Separate multiple properties with commas but no spaces. For the list of valid intent signatures you can use, see the Built-in Intent Library reference. This reference is organized by high-level category (such as Books, Local Search, and Weather) and then by the entity types used within intent signatures (such as Book, LocalBusiness, or WeatherForecast). You can also search the library of built-in intents when you add an intent in the developer console. Entity types such as WeatherForecast have their own properties that further define its attributes, such as startDate, location and duration. When users say utterances that invoke an intent defined with WeatherForecast, they may mention values that correspond to these attributes, such as the date and location of the weather forecast they want. These property values are conveyed to your skill as slots. Unlike with custom intents, you do not declare these slots in your intent schema. Alexa recognizes the slots from the properties of the objects included in the intent signature. If the user mentions any possible values for those slots, those values are provided in the request as slot values. The property name is used as the slot name. The SearchAction.object property has been declared as the type WeatherForecast. startDate is a property of WeatherForecast, which means it is now a property of object. You can think of the fully-qualified path to the startDate property as SearchAction.object.startDate. This is shortened in the JSON to just object.startDate since SearchAction in the intent signature defines the context. WeatherForecast.startDate: A date. This property maps to the AMAZON.DATE slot type to convert words like "today" into a date format like "2016-11-01". WeatherForecast.duration: A duration like "4 days." This property maps to the AMAZON.DURATION slot type that converts words representing durations into an ISO-formatted duration like "P4D". WeatherForecast.location.addressRegion.name: a region, such as a US state (AMAZON.US_STATE). WeatherForecast.location.addressCountry.name: a country name (AMAZON.Country). The references for the available intents include the list of slots your skill can expect. "What is the weather in Seattle today?" (respond with a general weather forecast). "What is the temperature in Seattle today?" (respond with just the current temperature and expected high). "When will it rain next in Seattle?" (respond with just the likelihood of precipitation). In the second utterance, the user referred to the temperature property of the WeatherForecast entity type. In the third, the user referenced the weatherCondition property by mentioning "rain." For example, if you put the intent signature SearchAction<object@WeatherForecast[temperature] in your intent schema, Alexa invokes this intent for weather-related utterances that refer to the temperature property. More generic weather utterances that do not refer to this property do not trigger the intent. 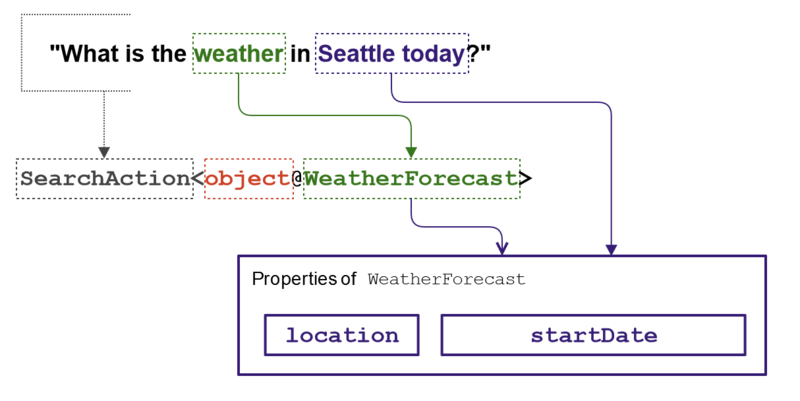 "What's the weather today in Seattle": Sends AMAZON.SearchAction<object@WeatherForecast> with the slots object.startDate and object.location.addressLocality.name. 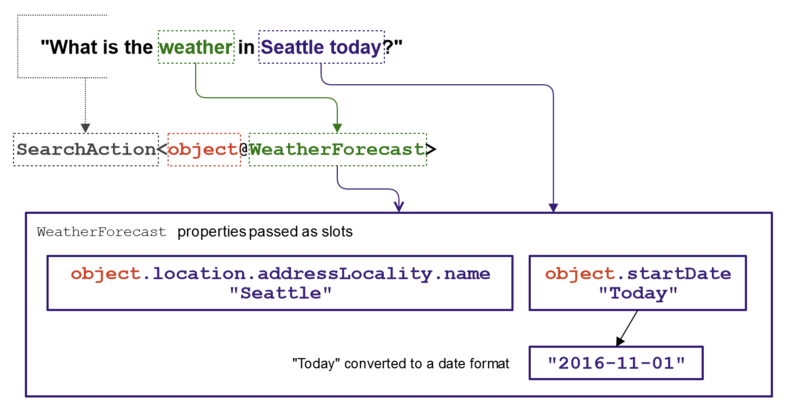 "What's the high temperature in Seattle today": Sends AMAZON.SearchAction<object@WeatherForecast[temperature]> with the slots object.startDate, object.location.addressLocality.name, and object.temperature.type. 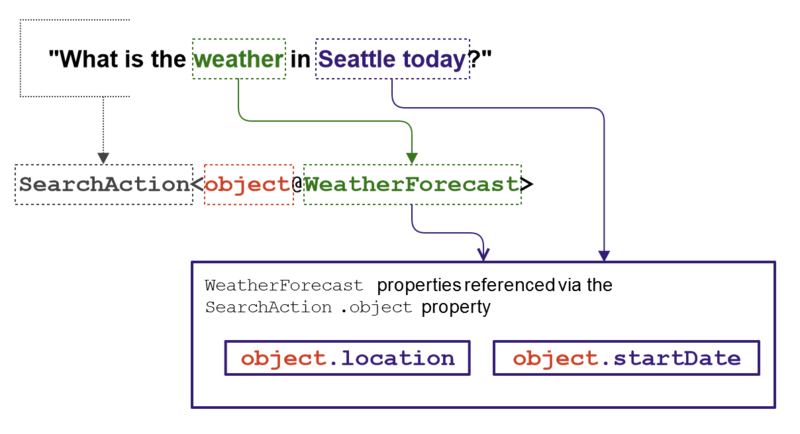 "When will it rain in Seattle": Invokes AMAZON.SearchAction<object@WeatherForecast[weatherCondition]> with the slots object.location.addressLocality.name and object.weatherCondition. See the available intents to see the full set of intents available for each entity type. Note: If your schema includes just AMAZON.SearchAction<object@WeatherForecast>, your skill will never get a request from the utterance 'what is the temperature today'. If you want to receive both the more general and specific requests, be sure to include all the intent variations in your schema. You can always handle them the same in your code if you don't need the extra data. User: Alexa, ask My Weather what's the weather in Seattle today? My Weather: Light rain this afternoon through tomorrow, with temperatures falling to 56 degrees on Monday. User: Alexa, ask My Weather what will the high temperature be in Seattle today? My Weather: Today, expect a high of 65 degrees, and a low of 49. User: Alexa, ask My Weather when will it rain next in Seattle? My Weather: Light rain is expected to start this afternoon, continuing until evening. User: Alexa, ask My Weather what's the weather today? My Weather: For what location? Alexa: Light rain this afternoon through tomorrow, with temperatures falling to 56 degrees on Monday. Note that the slightly different context of each question elicits a different response from the skill. For all of these questions, the skill needs a location and a date, although the date could be defaulted to today's date if not provided. The following example shows a possible intent schema for a weather skill. Note that it includes three built-in WeatherForecast Intents. These are specified with just the intent name, since the slots are recognized automatically. The schema also includes a custom intent for capturing utterances not covered by the built-in intents. This intent has a normal slot definition. Alexa sends the skill the AMAZON.SearchAction<> object@WeatherForecast> with today's date as the slot value for object.startDate. Note that the user did not specify a location, so the three object.location slots are empty. Skill keeps session open to get the user's reply. Alexa sends the skill the custom GetLocationIntent with 'Seattle' as the slot value for City. The skill now has enough information to complete the original WeatherForecast request. Alexa: Light rain this afternoon through tomorrow, with temperatures falling to 56°F on Monday. Note: You cannot define an interaction model that has no sample utterances. Include at least one custom intent with utterances in your interaction model. Based on the example intent schema, your code needs four intent handlers – one for each of the three built-ins, and one for the custom intent. Each handler gathers the information it needs from the intent and creates an appropriate response. Get the location and date from the slots (object.location.addressLocality.name, object.location.addressRegion.name, object.location.addressCountry.name, object.startDate). Validate inputs and do any conversions as need. Call a weather service to look up the weather. Use the weather data to construct a general response with the high and low temperature, chance of precipitation, and comments around sun or clouds. If the location slots are empty, the handler saves any existing data in the session and returns a response asking the user for a location. Use the weather data to construct a specific response telling the user just the high and low temperature: "Today's high is 65 degrees, and the low will be 50 degrees." Also get the value of the object.weatherCondition.name slot. This tells you the specific weather condition the user asked about. Use the weather data to construct a specific response about the particular weather condition: "Light rain is expected to start this afternoon and continue until evening." Get the previously-provided data from the session attributes. Get the data from the City slot. Validate inputs and do any conversions as needed. Use the weather data to construct a specific response based on the initial intent the user invoked (general, temperature, or weather condition). // Get the location and date slot values from the IntentRequest. // Note syntax for getting JSON values with a dot (.) character in the name. // Validate the inputs and do any conversions as needed. // of precipitation, and comments around sun or clouds. // and return a response asking the user for a location. // the user asked about is in the 'object.weatherCondition.name' slot. var output = "String with the weather forecast, with details around the specified weather condition." // Code for the custom GetLocationIntent goes here. See Alexa Skills Kit SDK for Node.js for details about how to use the SDK.